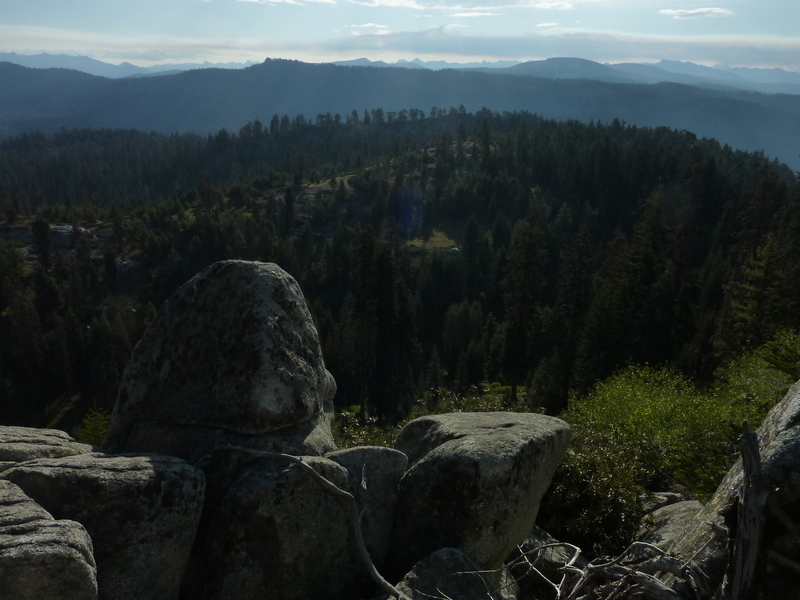 I was in Kings Canyon to backpack in to East Lake with a group of folks for a climb of Ericsson Crags the following day. This one would require rope and climbing gear and I didn't think I could do it as a dayhike, so I would have to resort to backpacking, one of my least-favorite thing to do in the Sierra (I would rather drive around in the open-top guided tour bus in Yosemite Valley on a busy holiday weekend, for example). In order to secure permits for our group, I had driven up the day before to get them for today, the Friday of the Labor Day weekend. I had gotten the last 4 passes when they opened for walk-ins at 1p, then spent the afternoon doing some easy hikes. Today I had the morning available until the others would arrive around noon for the long hike in. Rather than sit around and rest up which might have made more sense, I decided to get a hike in while I had a few hours. Peak 7,700ft lies just outside the SEKI park boundary, accessible from within, or near Wilsonia, a collection of private cabins inside the park, next to Grant Grove. A trail runs along the southern edge of Wilsonia from the Generals Highway up to Park Ridge. It is shown on the topo map but not on the park map and isn't well-signed. I parked inside Wilsonia where signs try to discourage non-residents, but I don't think there was anything illegal about where I parked in a dirt lot at the end of a cul-de-sac. I then made my way south through the forest understory to intersect the trail I was hoping to find (and did). I spent about half an hour hiking this trail up to Park Ridge where it connects with the much better Park Ridge Trail. This trail starts a mile and a half to the north at Panoramic Point, an alternate and possibly easier starting point. If one continues south on the trail for about half a mile, a lookout tower is reached, but I turned off to the east after less than half this distance. Just east of Park Ridge, the park boundary is crossed as you descend into Log Corral Meadow where there is evidence of heavy grazing. I crossed several dirt roads (the first one leads to the lookout tower) on my way across the meadow area. The cattle fence is dilapidated in places and hardly able to contain the cattle. In fact there were cow patties located within the park boundary, but I saw none up on Park Ridge or on the west side. Mild brush may help to contain them on the eastern side. After a little less than an hour's effort I had made my way to the top where I found some open views looking northeast towards Kings Canyon and southeast to Sequoia National Park. I returned much the same way and was back to Wilsonia and the van by 9a. I then drove down to Kings Canyon and Roads End where I waited for the others to arrive over the next few hours. By noon we were ready to head out. The weather was warm, but not hot, the skies clear with just a few clouds wafting about. There would be none of the smoke this weekend that has plagued the area periodically over the past month. Thanks to the climbing gear we carried, our packs would be heavier than normal and the hike up Bubbs Creek a little tougher. The others seemed to have more energy and eagerness to get up the trail and I found myself taking up the rear position most of the time, often getting well behind. When we reached the Bubbs Creek Bridge and the junction with the Avalanche Pass Trail, I stopped to give my feet a brisk soaking. The others were well ahead of me and were somewhat perplexed until I showed up another ten minutes up the trail where they were waiting. We continued on the trail another eight miles to Junction Meadow, passing by Charlotte Dome and Bubbs Creek Wall along the way. At unction Meadow we found Eric lying on his sleeping pad, having spent four hours waiting for our arrival. He had come in from the east over Kearsarge Pass early in the morning. We hadn't been sure if we intended to camp at Junction Meadow or at East Lake, so Eric had little choice but to wait for us to show up. East Lake it was. The crux of the day was the crossing of Bubbs Creek, normally no big deal by September, but this was no ordinary year and the water was higher than I'd ever crossed it. We took off our boots and socks (I had come prepared with sandals for this one) before starting across. Eric, Tom and Scott went over first, finding the water up to crotch level, but managing to make it look not so bad. I decided to toss my boots across to make it easier for me, but one of the boots bounced off a tree and into the water, saved from being lost downstream only by some quick action from Tom. Oh well, at least one would be dry. Stripped down to my underwear, I went across carefully, finding the pack actually helped by weighing me down enough to keep the current from carrying me away. I'd be lying if I didn't admit to being a little terrified during it all. Going last, Iris wasn't liking the looks of this at all. I tossed her my sandals to help with the rocks underfoot. I suggested we might use the rope for a rescue line should she slip and had Scott pull it out of his pack. Two NPS rangers happened upon the scene around the same time and suggested to Iris that she might find it easier to cross upstream where there is a confluence and the water is shallower. This took some time but eventually Iris emerged on our side of the creek, having successfully found a partially submerged log to assist in the crossing of the deepest part. We packed up the rope and reshouldered our packs, and with one soggy boot we continued up the trail.